While 2-way CrossFireX is technically possible with the AB350 Gaming K4, I would advise against it due to the bandwidth limitations on the second full-length PCIe slot; this is electrically wired to run at x4 mode at all times and shares bandwidth with the top M.2 slot. The emphasis is primarily on gaming with ASRocks contunuing partnership with Fatal1ty, for whatever that seems to be worth these days. $90 means there has to be some cut backs compared to the high-end products, so we see the audio/networking combination from Realtek which is often sold at a combined discount to motherboard manufacturers. The ASRock AB350 Gaming K4 does feature an element of customization through a set of red LEDs placed underneath the PCH heatsink which can be controlled via the BIOS, or with the ASRock RGB utility app. 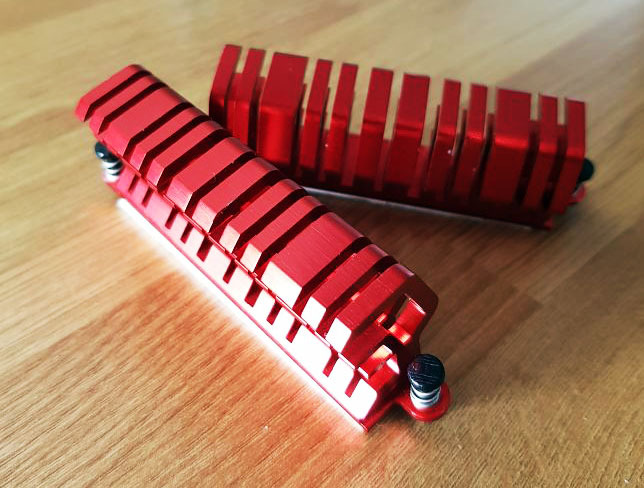 Users looking for RGB connectivity will be happy to know a single RGB LED header has been implemented, as well as a dedicated LED fan header. Following this, the AB350 Gaming K4 has a dedicated CPU fan 4-pin header with a further three 4-pin headers for system fans. Power to the CPU comes through an 8-pin 12V power connector with auxiliary power to the motherboard coming via the standard 24-pin ATX connector. Memory support is a plenty and thanks to the wave of AGESA BIOS updates that rolled out last year. The four RAM slots operate in dual channel mode and has support for a total of 64 GB of DDR4 memory with speeds up to DDR4-3200. Making up the power delivery on this board is an Intersil ISL95712 PWM controller with three initial drivers for the CPU which have doublers to make the total amount physical phases dedicated to the CPU at six. The ISL95712 on paper can only handle four in total, so an additional Intersil ISL6625 driver is featured. Sinopower SM4336 and SM4337 MOSFETs make up the SOC and CPU sections of the power delivery, which aren't the most efficient choices in the grand scheme of things, but these are more than capable of handling an eight core Ryzen CPU with a modest overclock such as the Ryzen 7 1700 used in our AM4 motherboard reviews. In addition to this, there is a single Anpec APW8720B driver taking care of the memory. 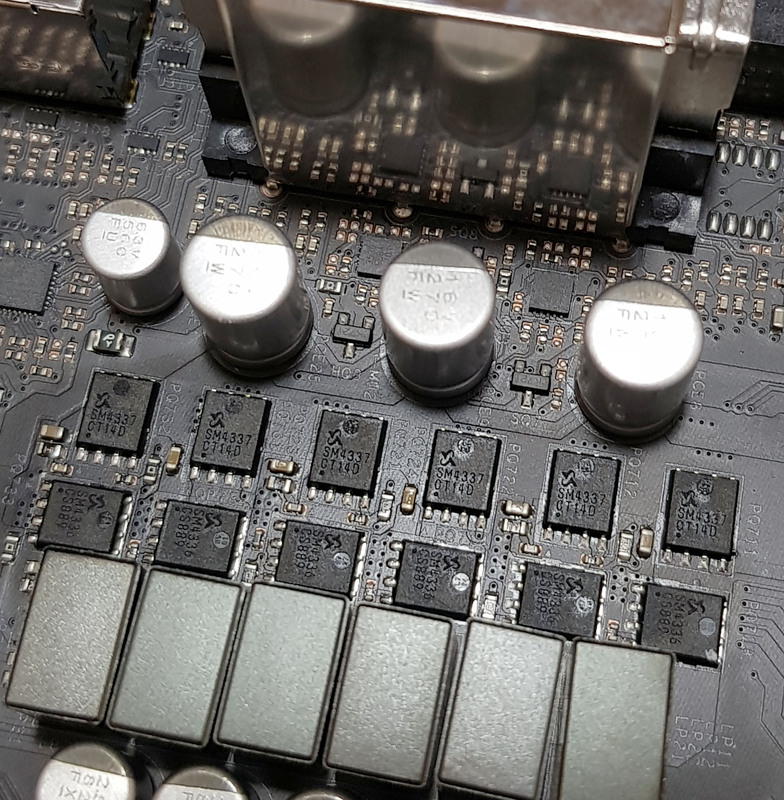 Just peering at the VRM heatsinks a little bit better, they don’t seem anything overly special, but they certainly kept their cool with our Ryzen 7 1700 running at 3.9 GHz. The only caveat with them is the use of plastic push pins which I’m not a massive fan of. Not just from a robustness/quality point of view, but they only apply so much pressure between them, the thermal pad and heatsinks themselves. MSI’s B350 Tomahawk uses screws and I much prefer this method of fixing to simple plastic pins. But everything has a price, right? 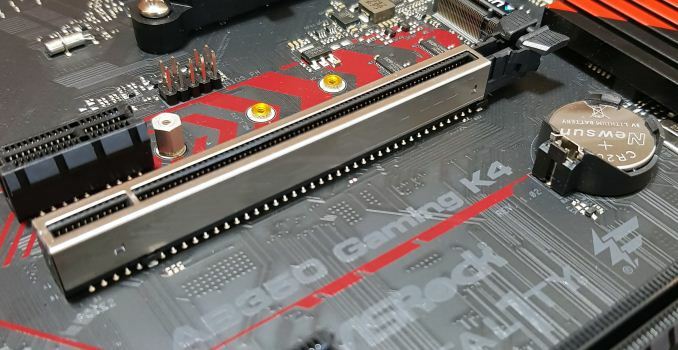 The PCI layout and configuration on the AB350 Gaming K4 gives two full-length PCIe slots, with the top one running at PCIe 3.0 x16 from the CPU and reinforced for heavy graphics cards. The second full-length slot is a PCIe 3.0 x4 connection, also from the CPU, but shares bandwidth with the top M.2 slot. The other four shorter PCIe slots are PCIe 2.0 x1 from the chipset. 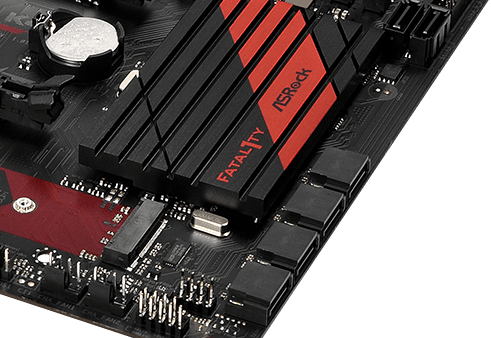 Touching more on the storage options, ASRock has achieved dual M.2 ports on this board which if needed, is there to be used. This is something not usually seen on lower costed boards, but there is some sharing going on: if a user has a drive in the second M.2 slot at the bottom of the board, this slot shares lanes with the third SATA port and if one is in use, the other will be disabled and visa versa. Rounding off the storage are four right angled SATA ports and two straight angled SATA ports. The pair of straight angled ports are controlled by the ASMedia ASM1061 controller, while the four right angled take adage from the chipset itself. The SATA ports have support for RAID 0, 1 and 10. 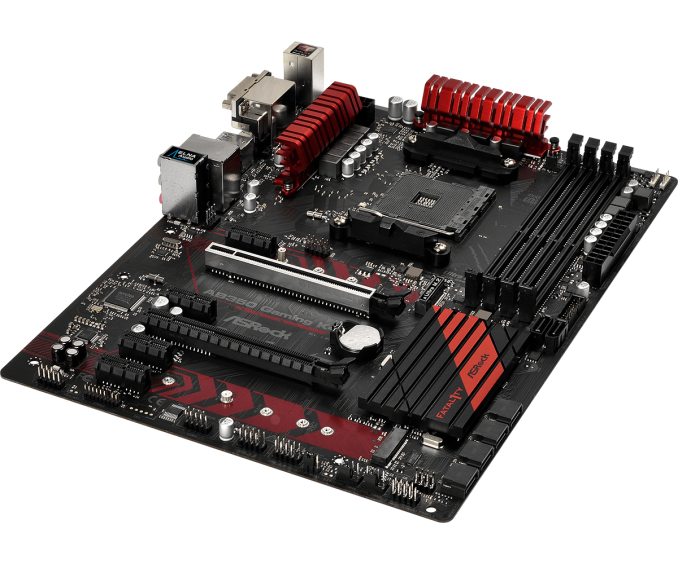 On the rear panel, the AB350 Gaming K4 has a very similar layout to the competition with the main difference being the inclusion of a further two USB 3.1 Gen1 more than the Tomahawk. This gives the ASRock option a total of five USB 3.1 Gen1 Type-A ports, one USB 3.1 Type-C port, and a further two USB 2.0 included. A combo PS/2 keyboard and mouse port sits just below the USB 2.0, with a section dedicated to utilizing the new Raven Ridge APUs onboard graphic capabilities thanks to a D-sub, HDMI and DVI-D slot being featured; the VGA is controlled by the Realtek RTD2168. The single LAN port is controlled by the Realtek RTL8111GR with the three 3.5mm audio inputs from the Realtek ALC892 codec. There is a distinct lack of USB 3.1 Gen2 ports anywhere on the board, despite the chipset support, but this purely comes down to cost. 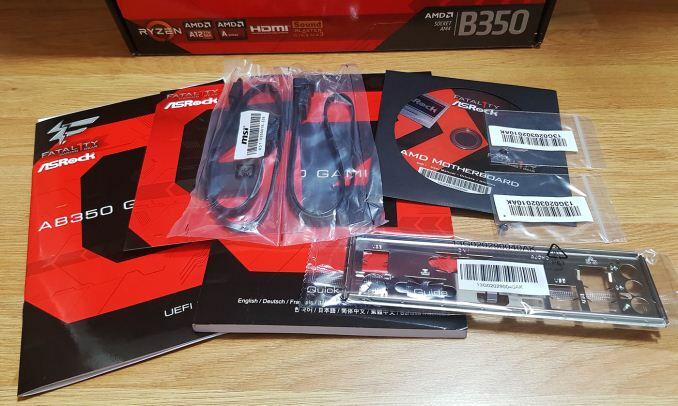 The ASRock AB350 Gaming K4 has a relatively basic set of accessories, but from a logical stand point, it's to be expected given the low cost overall.